Eliminate youself in home the error full waste ink pad counter for printer Canon MX360 with the next steps. This printer is really affordable and easy to use, it is for domestic and micro enterprises use. Many of these printers have been marketed in Latin America with proper functioning and up to now good performance in working with this all in one printer you can print, scan, send and receive faxes and copy. These printer are really recommended for continuous ink systems since they use FINE Canon ink cartridges with with Japanese manufacture of cartridges which support a large amount of ink inside without spilling. These printers print pages in A4, B5, A5, Letter, Legal, envelopes (DL, 10 Commercial sizes) 10 x 15 cm, 13 x 18 cm, 20 x 25 cm, they are compatible with the Windows 7 (32 y 64 bits), Windows Vista (32 y 64 bits), Windows XP SP2, SP3 Mac OS X v.10.4.11 - 10.6 operative systems. see tutorial to eliminate full ink absolvedor error next. To carry out this procedure in your printer it is needed that the printer is plugged to your computer and that both of them are fully working, you will work with a file called ServiceTool_V2000 which is compatible with the Canon brand printers, for this specific printer there is a different procedure, this one will be shown next. First of all download the resetting that will be use to do so click on the following link. This document is hosted in Google Drive, in case you do not know how to download this file see on how to download it, see the following procedure. The printer has to be plugged to the printer through the USB cable and the printer hast to be plugged to the power supply, too. Turn off the printer by using the "ON/OFF" button in the main part of the panel. Leave the printer plugged. When the printer is off press the "Stop/Reset" button and without releasing it press the "ON/OFF" button, too. Now without releasing the "ON/OFF" button release the "Stop/Reset" button. Keeping the "ON/OFF" pressed and now press five times the "Stop/Reset" button. After pressing five time the "Stop/Reset" finally release the "ON/OFF". The printer will be recognized again, a screen indicating that a printer has been plugged but not install will be displayed, it is normal since as already known when resetting a printer it loses its settings and it is as placing a new printer. If the process has been performed well in the screen a "0" will be shown. Now open the file and start its running. We are talking about the program that was previously downloaded. Now all that is left is to close the program, turn off the computer and turn it on again. In case the procedure does not result as expected, do it again and verify that everything is alright, if it is still not working contact us by leaving a comment. 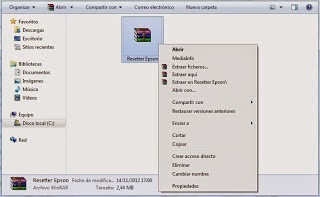 We know you can also be interested in downloading this printer drivers to do so select the operative system you are using as well as the language of the software you want to install by selecting the following menu in case you do not know which operative system you are using read our post on how to know which Windows I using. You can also be interested in the user manual in pdf.